It is the static and motionless ground on which we walk on. It is the medium in which life begins and continues to thrive. It is the foundation of our very existence, the stone that stands alone in the vast darkness. It provides pathways to human life, for human life, and beyond human life, never asking for anything more than to make it use of its resources. However, the ground is crumbling. Lands are shifting, as if the Earth itself is lost without direction. To become one with the stone that wanders in space, one has to be able to stand tall and lead others through adversity with confidence and pride. One must be stable, calm, and fully aware of the situation at hand and thrive in staggering conditions. To accept... to become Sapphire... is to become the foundation of the Earth... and of human nature. Okay, we know what you're thinking: where's the #9 vs #18 matchup? Apologies for top billing the "wrong" Kugimiya vs. KyoAni match, but Aisaka Taiga is actually a slight favorite (barely) to defeat Hiiragi Tsukasa down in Sydney. For three of the four featured matches today, with the beginning of Sapphire comes a more looming reality washing ashore for many of our candidates, especially those who are at the bottom of the overall standings. Yes, the International Saimoe League is a tough place to win, and to win consistently can get you to places far and beyond what many merely dream of, but if candidates perform decently� say .500 worth, then they may have a more than likely chance to come back next year. That line is now currently far out of reach for some of our candidates already. In fact, the candidate currently in last place is only five losses away from locking herself out of next year's competition. This means that if there is any chance a candidate can come back next year with a full year of experience, now is the time to put up or shut up. Both Katagiri Yūhi and Misaka Shiori are almost at a deadlock in the overall standings, and both may be still a full period's worth of losses away, but time is running out for the both of them to make a run at a return. This match is too close to call. Which one will win today in Jakarta and start building momentum to make a run at a winning record? Both of these candidates are in the bottom 32, but Hakurei Reimu has been loitering around the .500 line for quite some time. It's unfortunate, however, that she's in position only to squeak by the .500 rule, given that she was the top prospect to come in via preliminaries, but at least she has a better hope of returning to ISML 2010, given that the next Tōhō Musō Kakyō candidate is only at (7-20) with 36 matches left and rumors that many of them might not be allowed to return next year, depending on what the rules for 2010 are. That being said, Reimu is flying what many say could be the "non-anime" banner into a predominantly anime-based contest, and so far she is doing well. Tonight, she faces Kamio Misuzu, the lone representative from AIR who isn't doing that well in the .500 department but still has a very good chance to go above .500 in this period, and in a contest in which wins are hard to come by, she'll need all of the help she can get. This one will be close, as there is no clear outcome given that both of their statistics are very close to each other, so it's going to be exciting for sure. Will Misuzu pull off a win from a potential rival or will Reimu pull away from the .500 borderline? If there is any need for a wakeup call, the time is now. Kōzuki Kallen and Ryōgi Shiki seem to be on "happy to be here" mode, which is not the mood you want to be in for this tournament. Sure, it is nice that Shiki gave Kara no Kyōkai some exposure to voters and Kallen came by to give C.C. some added support, but the effect of their late entries in the preliminaries have provided a minimal effect, if not a fully negative one. Shiki was not able to capitalize on a preliminary victory she worked hard to achieve, and Kallen actually hurt C.C. 's performance, bringing C.C. down from a top 8 finish last year to what could be a no-show next year. And with only eight losses to afford for each, they will have to find some way to rise to a production of (7-2) on average or they will not be able to come back. It is time to either stand up and fight or get ready to be seated in the audience for next year. Which one of these girls will be struck down early? Thanks to minhtam1638 providing today's match descriptions. On paper, this is the match to watch, as both candidates overall have put up the same performance on average throughout the season. However, do recall that while Ryūgū Rena was on an "18-10" pace all season, Shinku was barely treading the waters of the .500 borderline before her breakthrough Amethyst campaign. If current trends stay as they are, then Shinku could be considered as an acceptable favorite, despite the fact that she has nothing but a slowly-ongoing manga series as opposed to the Higurashi Rei OVA. Despite this, the Rozen Maidens are now on high alert; the last time a non-KyoAni group had a breakthrough necklace period (Shana doesn't count), they broke down multiple periods after, a meltdown that left only one candidate from that group return to this year's competition only to do poorly. Certainly, if Shinku is to pull a win over Rena today, it will have to be a near decisive one or questions will start to arise. As for Rena, she's still hanging strong from her pace last year, but she'll have to step it up if she wants to make top 16 — only four wins separate her from 16th place. Will Rena start to rise to the top and carry the Higurashi banner or will Shinku make a legitimate run for the Sapphire necklace and prove her Amethyst run wasn't a fluke? While a race to the top 16 is a competition between those in the top 24 trying to vie for a double-elimination slot, the race to making at least a .500 percentage for a winning record is a race against the candidate vying for it. It truly is a test of character, challenging a candidate's composure, so long as she does not burn out and destroy her long-term success on short-term miscues. Maria has been in this position before, finishing only 28th last year with a (38-25) record, so she knows what it takes to make it to next year's competition. In fact, she may have a slight advantage over Kawasumi Mai, who has not been in this position before despite usually never losing her composure at all. Last year's 16th place finisher is now at (14-14) but can get an entry into next year's tournament by averaging at least 4.5 wins per period, and for Mai, or at least for Kanon, getting into next year's tournament is now a main priority following the fallout of five successful 2008 campaigns. Now Mai faces a tall order against Maria, whose advantage is only improved by her currently airing Hayate no Gotoku series. Can Mai pull a quick win today or is Kanon destined to be forgotten? Three times. That's how many times Suigintou has run into Shana. That's how many times Suigintou has lost to Shana. That's how many times Suigintou has been washed away by Shana without even coming close to six feet on the scoreboard. That is how insignificant Suigintou - or anyone for that matter - has been to Shana as of late. 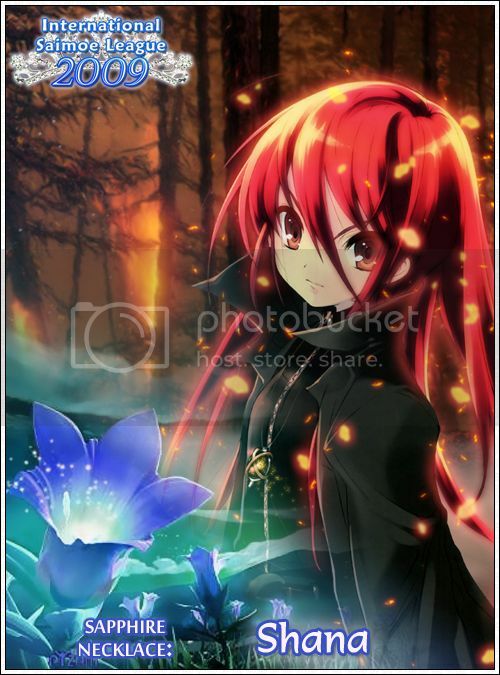 Shana has been winning matches left and right in the history of all Saimoe contests. She has a career record of (89-7) in ISML alone, and with only one loss this season, tripled with the largest average VF and a threat that only Suzumiya Haruhi can match statistically, she has become a major threat to the rest of the ISML roster. Despite this, she hasn't faced a Suigintou that is more prepared than ever to tackle the biggest challenge in her Saimoe career. Suigintou is only five months removed from winning the Korea Super Best Moe '08 championship, a championship that Shana tried to defend, and she now has the '09 Amethyst Necklace in possession, matching that of Shana's Aquamarine from 2008. Bangladesh is in for quite a show. Will Suigintou finally be able to get past the one pillar that constantly stands in her way, or will this match become yet another footnote in Shana's already storied history? Tonight's match set includes a pair of Lucky Star vs. Mahō Shōjo Lyrical Nanoha matches that promise to be interesting, and the first takes place in Seoul where a pair of top 16 candidates collide. It's actually amazing, however, how Fate Testarossa is still holding strong with a (27-2) record heading into today's match. Among candidates who currently have more than 25 wins, she currently has the least number of votes accumulated with one of the weakest schedules among them so far, so her record at this point might be very misleading. Yet, Fate has a very uncanny ability to rack up wins without showing off, as she has shown in last year's ISML competition. Tonight, she is facing Izumi Konata, whom currently has three less wins than Fate but is putting up the same kind of performance Fate has shown throughout the tournament. With both of them having almost the same statistics across the board, and both of them having yet to lose in a Sapphire match, this one will be too close to call, almost as if tonight's match is virtually a mirror match. 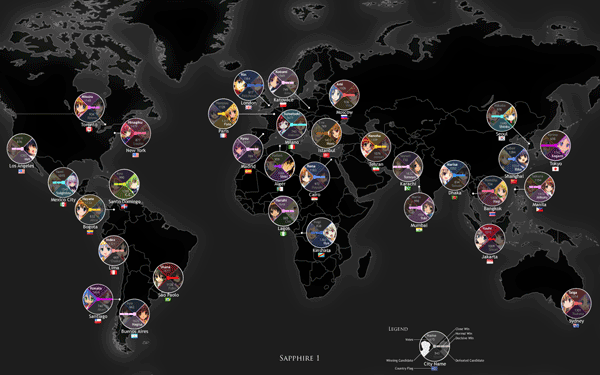 Someone's road to Sapphire will end tonight, but whose road will it be? The other half of the Lucky Star vs. Mahō Shōjo Lyrical Nanoha tag-team match takes place in Lagos, Nigeria, where Takamachi Nanoha will be facing off against Hiiragi Tsukasa on what could be an epic rivalry. The last time they met was in Ruby 7, 2008, where Nanoha barely scraped away with a 372-368 victory against a Tsukasa that was struggling to make the top 16, a match that could have very easily changed the landscape of the 2008 double-elimination championship for the Tiara. Now, a candidate ranked 21st overall and out of the Sapphire running could pull off a payback upset against the only top 16 candidate who has yet to break the 40,000 vote mark. And to make matters worse for Nanoha, Tsukasa comes in at a very slight statistical favorite (though not by much), as she has accumulated more votes than Nanoha overall on a slightly tougher schedule heading into this point, so if Nanoha wants the Sapphire necklace in her possession, she may have to put a little more effort in this match today. Will Nanoha avoid an upset or will the revenge factor work well in Tsukasa's favor? Sapphire may as well take a back seat - sort of. Tonight's match set is highlighted by three matches, all of which have implications on the top 16, namely rank No. 16. However, this match is too close to call to pass off for top billing. Both Aisaka Taiga and Fate Testarossa are still in contention for the Sapphire necklace after three matches, and the number of votes they have accumulated up to this point are seperated by only 235 votes in Fate's favor. That means there is an average Votes For difference is a mere eight (8). However, Fate may be considered slightly more of a favorite than that - she has struck down many tough opponents that Taiga has yet to meet, making her average SDO by the win a forty (40) compared to Taiga's (35). And to tilt the mark even more to Fate's favor, Taiga has yet to defeat a member of the "Elite 7", a term coined to the top 7 seeded candidates in 2008 for their dominating performance in the regular season, and the Elite 7 currently occupy all of the top 7. Still, Taiga has been outstanding, being the only candidate participating in her 1st season in ISML to be currently ranked in the top 24, not to mention the top 8, but she can't be satisfied to be just this strong. It might not be considered an upset statstically, but for a newcomer that hasn't step foot in Saimoe Japan to defeat the defending Tiara-bearer of ISML will automatically elevate the newcomer's reputation. Is Taiga capable of pulling a historic defeat or will Fate deny her yet another necklace run? Friday's loss left Furukawa Nagisa in a dangerous spot. After losing convincingly to a red-hot Suiseiseki, whom is now one dango loss away from reopening the race for the top 16, Nagisa will have to avoid a loss today, else she will have to be sprinting for wins in order to even make the double-elimination post season. Unfortunately, she's run into the wrong opponent from Tier 3 - Blue at the wrong time. Now, instead of facing a struggling opponent such as Tsukimiya Ayu or Mizunashi Akari, Nagisa now faces Saber, who is currently safely in the top 16 with at least two or three losses to spare. Both Saber and Nagisa finished in the top 24 in ISML, missing the top 16 by at least three wins, and both have improved on last year's performance. However, while Saber has been outstandingly strong pulling off a handful of wins here or there, Nagisa has been seeing her performance considerably slip from an (8-1) Aquamarine campaign to a (6-3) Amethyst, and a recent loss to a candidate ranked below her is not a good sign of things to come. With both candidates out of the Sapphire running, this is a battle that will purely affect the top 16 after this match set, if not after the season, concludes. Will Nagisa be able to defend her spot in the top 16 at least for another week or will the race for the top 16 experience a little chaos? It's a little ironic that both of the Furude sisters are battling each other in Bangkok, a city that bears a slight resemblence to Hinamizawa, the setting of Higurashi no Naku Koro ni. Yet, given the tangibles of this match, many would think that Rika certainly has an edge over Hanyū for this match. First off, Rika has more wins than Hanyū while facing a slightly tougher schedule overall. Understandbly, she accumulated more total votes than Hanyū in order to get those wins. Rika has also made it to the ISML 2008 top 16 whereas Hanyū barely made it past .500. Rika is also the 2007 Saimoe Japan champion, and has made it farther than Hanyū in the subsequent Korea Best Moe championship. To cap it all off, she has become the face of the Higurashi series as of late, and she is the main star the currently airing Higurashi Rei series. However, it's the intangibles of this match that can throw favorites right out of the window. Rika currently leads the Sapphire standings with an SDO of 18, compared to many others who have an SDO of 12, making her a target for defeat coming into this match set, and while Hanyū probably wouldn't mind giving her a win and launching her into the top 16, she might just overdo it in this match. Therefore, the residents of Thailand may see an upset that no one would dare to expect. Which Furude sister will come out of this match the victor? It seems the name Sakagami Tomoyo and decisive matches go hand in hand, as for every necklace won so far Tomoyo has had a large impact on the eventual winner. She won against Shana to claim the Aquamarine necklace, her loss to Nagato Yuki granted Yuki the Topaz necklace and her defeat of Hiiragi Kagami opened the way for Suigintou to claim the Amethyst necklace. Now once again she finds herself in a critical match in deciding who gets the necklace, although based on statistics she is in with an outside chance to win the necklace herself, Tomoyo can still play the spoiler and all Tomoyo has to do is defeat Fate Testarossa. All Tomoyo has to do is defeat the current bearer of the heavenly tiara. Statistics say Tomoyo has a slight advantage, but Fate is currently in a stronger position second in the table in Sapphire and a win here will grant her a strong chance of winning the necklace, and with Fate in with a chance of winning her first necklace, you can be sure that a slight advantage based on previous performances wont be much help. Will Bardiche strike down Fate's opponent? Or will Tomoyo's kicks grant her victory? Thanks to ilkaid for providing today's match descriptions.